Living in Uptown, Chicago where street gangs vie for business… considering both business people and drug lords in the news… politicians, the tech industry, nation vs. nation etc., etc., the longer I live the more I see turf wars. We can truly think and say it’s about right vs. wrong- and sometimes that’s absolutely true… but a great deal of the time it’s about “your way” or “my way”. And you and I both assume our personal way is THE best way, period. Sometimes either you or I are correct. Sometimes not. Sometimes neither of us is! Then we have what some consider a filthy word: “compromise”. It’s been many years since I heard a well-known minister carry on about compromise being pretty much a synonym of “selling out”, the “slippery slope”, the “going to hell in a handbasket” syndrome. Again, this -can- be and at times IS the case. My own perspective is that there are times when an argument is at core a matter of turf, of win-or-lose, about power, authority and who gets to ride in the lead float in the Big Parade. Petty in my view, just kingdom-of-self stuff. As time moves along I hear of church folks, ministry staff, political leaders, business and other people, unions and corporation execs. all sliding down this same old funnel. I wonder if many Americans have faced the fact that within our broad, immigrant society of 200 years we’ve got a DNA that just screams “excess”… “no moderation here!”… “all or nothing in this game” and the like? For all our good qualities (and there are many), Americans are often known for our lack of moderation, lack of sense, lack of long-term consideration of how X, Y or Z will affect people and even entire nations. Jesus said “To whom much is given, much will be required”. We have SO much, especially in comparison to most of the nations and people groups outside of the U.S.A.! So I would like to posit this: sometimes “compromise” isn’t a dirty word. Sometimes it is synonymous with “sense”, “proportion”, “consideration” and even “love”. Not bleeding-heart, hard-core leftist ideology, but a desire to link rather than separate. I find this Spirit (yes… Holy Spirit) and spirit among plenty, even most of those I meet in The Evangelical Covenant Church. Do we all agree on everything? NO. Do we fuss and fight over issues, jockey for position and sometimes see relationships sever? Yes. But you can’t have community if you don’t fellowship over what you have in common. Sharing is not an option. It’s actually commanded by God in both the Old and New Testament. Now, you can rebel against Him and His Word, plenty of us do (I sin daily, I’m sure of that!) but let’s not pretend ours is the pristine life of faith and love. Further, common sense seems less and less common in our culture. Again, I don’t mean by this to say “If you saw things MY way, THEN you’d have common sense dude!”… not at all. What I mean is that the lack of patience, lack of listening and really trying to hear what, why and how someone you disagree with has come to their position on this or that often blows common sense, any true sense of sharing grace (important word, no?) and at least being sure what you THINK you understand the other person or people-groups views are… right out of the water. And we all drown for it. After four decades of living close-quarters with hundreds of very different (with very different views) people of widely differing ages, subcultures, spiritual experiences (or lack of them), etc., it does seem to me the general sense of education, communication skills, listening, actively learning to interact rather than “take your marbles and go home” produces (and perhaps signifies) an element of humility and sane compromise. Perhaps there is something God-honoring in a desire to stick together and stick it out even when the crosses show up… and show up they will in ANY sort of gathered people. When this isn’t done on both sides of the street, aisle (Congress), woods, neighborhood, bad things happen. Little castle walls go up. Moats get dug, fortifications and weaponry appear on the parapets. Jesus said “Those who live by the sword shall die by the sword”. And He also COMMANDED US to love one another. All this with the knowledge (I assume!) we would never fully agree with one another on any number of issues. Your turf? My turf? Maybe “our” turf is closer to what the Lord calls us to? Matter of fact, when it all boils down, it’s all HIS turf. OK, I’m all-day in Thomas Centennial Park in Chesterton, Indiana Sat. Sept. 28. I’ll be there from about 10am to 5pm with other artists bringing music, cds, arts and crafts. I’ll also be doing a workshop, on-site building cigarbox guitars and basses… and checking out recovering peep’s cool artwork too. Frontline wants to raise awareness and hopefully get some sponsorships going for people who like myself, deal with addiction and recovery needs. Aracely (another friend of mine and label-mate at Grrr Records), myself and several other bands will bring a broad variety of music. That will begin at 11am, Aracely plays at 1pm, I’m up at 2pm with a solo blues set. Hope to see some of you there. Come hear, see, learn and maybe take some sweet art home with you! 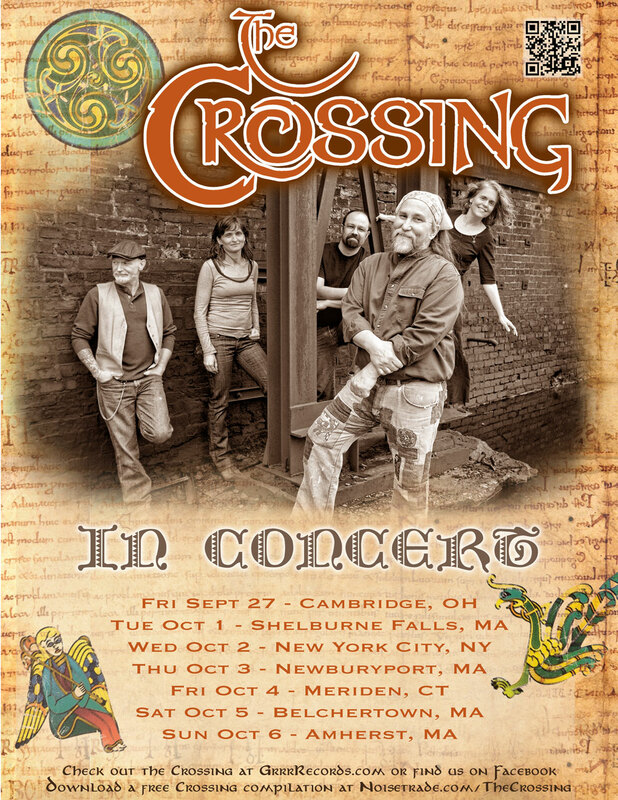 The Crossing Tour Poster/Info. Here! She’s got some dental work to be done, I (once again) have -got- to begin exercising and eat healthier. We’re getting closer to her hip replacement, a number of meetings with doctors and such and we’ll have a plan and dates on all that. Thanks for prayers. Funny, as we age… well… as I age… heh… hair goes, hearing goes, eyesight, etc., etc.. The other day I totally spaced on something I was saying to my family and one of my daughters said “Dad, if you hadn’t done this all my life I’d be worried” and we all laughed. It’s true. I was around 17 years old visiting my Dad (parents divorced so I was visiting) and he forgot something obvious, I told him I did the same all the time. He laughed saying “I think I have a touch of old-timer’s”. No laughing matter for folks with Alzheimer’s and I don’t mean to speak lightly of that at all… but the fact is that aging is an entire new journey for a lot of folks and few people are told (or think) enough about it prior. From very early on I was around folks a great deal older than myself and so have never thought them “odd” or whatever. I think the Lord schooled me early on about such things. The truth is that I’m happy to age. But Wendi and I often remark that it’s too bad wisdom comes so late in life when you could have used it so very much when far more young! This is where one of my true worries comes in… that of biblical illiteracy in so many peeps these days. I suppose this, too isn’t really all that “new”, but it does seem fewer people are seriously studying The Bible and are just not clued in on what God thinks, says and feels about them, their neighbors, life and both what authentic love is and how to share it. So many want to write their own story exclusive of the Story of God. That’s a train-wreck no matter what you think you gain. This is a burden to me. If I had known His Word much younger I could have at least escaped -some- of the addictions if not all that eventually nearly killed me. And the fact is I was (as all of us are) an “evangelist” for what I believe in, for what I thought was good -though much of it was like gravel in my guts. Drug, alcohol and sexual addictions are just that, monkeys that not only ride you but eat you little by little until there is less of you and more of the devil riding inside. Been there, done that. Jesus DOES set people free- but such genuine freedom and life doesn’t happen by mindless drifting and choosing friends, situations and pleasure trips that only wrap and chain us. Someone once said “The dog you feed is the one that grows”. The Book says “Don’t be deceived, God is not mocked. Whatever a person sows, that they shall also reap”. Yep. Yes. While some say Christians are mindless dolts who buy into a sort of mythology that is better left in the ditch, I’d say the pain of loss, aging and death itself is a wake-up call from God. The Bible tells us “The one who has the Son of God has life. The one who does not have the Son of God does not have life”. Fact. No joke. This Sunday :Blues and BBQ! Had a nice chat with a former denominational president this morning which once again reminded me of the old paradigm “Believe, behave belong”. He mentioned how this has been turned on it’s head over the past few generations in culture. It’s now (as a book study he was in brought to light) “Belong, believe, behave”. We had begun to ponder this several years ago when hearing this new phrase on an overseas tour. Sometimes Christians (and other groups) are so obsessed with behavior that belonging is impossible, so focused on the newcomer or “outsider” coming to faith that the concept of honest, slow and relational interaction outside of these two matters isn’t even considered. I was often guilty of this as a young leader. As we age we either become more brittle and at times, indifferent or our hearts grow (spiritually speaking) and therefore engage at a different and often deeper level with both God and others. I find the temptation to remove myself from the associated pains of getting close to really difficult people as real in my life as anyone. Like Jonah, I have often wanted to head in the opposite direction! How about you? “Face value” is only one way of determining what’s true and real about others, and when you cross-reference and over a long stretch of time begin to unravel and discover who a person really is, how they became who they are (at least who they are at that stage in their life) and what their actual issues are, well this takes a level of love and commitment that goes far beyond most people’s willingness to give. I find it’s not others’ misery that troubles me as much as my own reluctance to share it with them. It’s true that hurting people hurt others- so when you’ve had your stuff stolen, watched others hurt by the individual in question, a rather habitual routine of blow-ups, continual, blatant lies being told (about those who have loved and served the person most) and on and on… well it becomes clear why people just want to live a quiet and near-hermit existence far from the crosses associated with such relationships. A mentality of avoiding and escaping from the presence of troubled people, letting “someone else” deal with them is a common thing. It is indeed part of the reason for attrition rates among leaders in churches and ministries. The great joy of service is of course being present during some of the victories, healing and grace of change in people’s lives. What can take a toll and actually works to drive some away from God’s calling on their life is the darkness and personal hurt which is part of the job. It is the worry and struggles that can enter in not only bringing negative affect in the minister’s life but the lives of their spouse and children. None of this is meant to sound like a violin-and-crybaby routine, I’m simply saying that over my years of personal experience as well as in countless discussions with leaders and former leadership in Christian pastoral, counseling and other ministry areas, these things can take a toll. For myself? I truly understand the cost and yet cannot simply ignore the call of God to love and serve the “least of these” whomever they may be. For me it comes down to surrender to the Lord, not salvation by works or trying to impress anybody. I do indeed deeply appreciate those who serve the most difficult people day-by-day! In His grace, the Lord has given me a number of personal “safety nets” where it’s only now and then I must deal with such troubled folks directly. The fact is that it’s far more easy to write and sing songs about life than live it side-by-side with messed-up folks. Only God knows who truly believes. Positive behavioral change? In the end, I would say it’s equally true only God knows who has experienced that! Belonging? Hmmmm…. that has a lot to do with you and I. In my view, these are things worth considering. Thanks for stopping by! Wow. A dude at cigarboxnation.com had offered a clone of one of the famous little Minty Amp designs available from Radio Shack (parts… you must build it). Had a friend build me 4 of ’em. I mean they COOK! Very cheap and simple but amazing tone and very gracious regardless of which speaker or cab you use with ’em. Little 9 volt battery-powered thing, just 1 gain control, no tone, plug in a guitar cable and the amp turns on, unplug the cab;e and it’s off. Knock-off of a Smoky practice amp but in my view, better and more versatile. Oh, they named it Minty because you can actually install it with 1 or 1 1/2 in. speaker in an Altoids or other such tin and carry it around as a practice amp. But I think I may use this thing live mic’ed after building a few cabs with larger speakers… it sounds that good. Not certain about that yet but I’ll sure give it a go!